The Dallas/Fort Worth Metroplex is a confusing place to navigate. At least it is for me, even with a good GPS. When staying in the Dallas/Fort Worth area, you need a great place to base yourself. A place that’s not crazy-busy. A place that’s simple to get in and out of. And a place that exudes Texas charm. Denton, Texas is all those things. And, of all the places I’ve stayed in the area, I cannot recommend Denton highly enough. I will admit I’ve become a little disenchanted with Texas over the last ten years. After living in Texas for over twenty years, I felt that Texas had lost that charm for me. The charm that attracted me to it in the first place. That was until I spent a long weekend in Denton. Denton is located north of Dallas/Fort Worth but within the metroplex area. My faith in that southern charm, that genuine Texas charm that hooked me in 1992 when a waitress smiled at me and asked: “how y’all doin’?”, has returned. For that Denton, I thank you. So let me fill you in on why Denton is the place you should be basing yourself, or at least spending time exploring when you visit the metroplex area. Denton is about 45 minutes from Downtown Dallas and 35 minutes from downtown Fort Worth. In my opinion, Denton is its own destination. In fact, I spent three full days in Denton and did not feel the need to go to either of the other two cities. At Denton’s centre, you have the beautiful Denton County Courthouse, which is located in the middle of the city’s square. Surrounding it are shops and restaurants which reverberate with the city’s charm and hospitality. Nearby, is the Bayless-Selby House Museum, a grand Queen Anne–style home with Victorian interiors. At the Texas Women’s University, there is the Texas First Ladies Historic Costume Collection. Lewisville Lake is ringed by parks and marinas and is rumoured to be full of bass and catfish, a fisherman’s dream. I wasn’t in Denton for more than five minutes before the locals were sweeping me off my feet. I can’t even say it was intentional, because no one knew I was a blogger. (People tend to bend over backwards if they know that sometimes). Instead, it was their natural way. Charming. Helpful. Hospitable. After checking into the Embassy Suites by Hilton, Denton Convention Center, I grabbed a small lunch at the attached restaurant, Houlihan’s, before discovering what Denton had to offer. Afer the food order had been placed, the waitress shared her tips for Denton. She told me about a secret bar, the best places for brunch, some great places to hear live music … it was fabulous. All that was asked was ‘What are the best places to go in Denton?” It wasn’t overwhelming or in a pushy way… just plain ol’ southern hospitality. Some of those places were also listed on the recommendations I’d received from the Denton Convention & Visitor Bureau which was handy because I wasn’t sure I’d keep it all straight. From that moment on, I was pleasantly surprised at how happy people were to make conversation and to provide great service. Unlike a lot of customer service today, Denton was not a ‘turn the tables’ kind of place or simply ‘serve and move on’. Don’t get me wrong – the service was fast – everywhere – but the service itself was laid back and friendly. 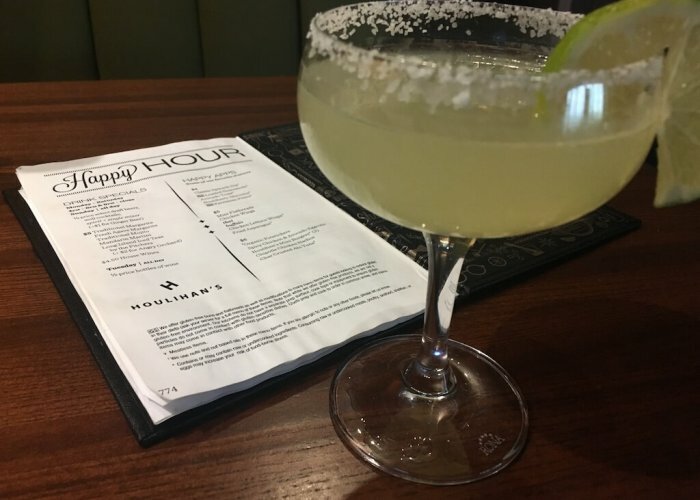 And, it was everywhere – starting from the waitress at Houlihan’s to the service I received at the Luxury Nail Bar, where I stopped in before I left town; From A Creative Art Studio to Barley and Board, bumping-busy on a Saturday night. It was all amazing service. I appreciate that nowdays in this mad, mad world. 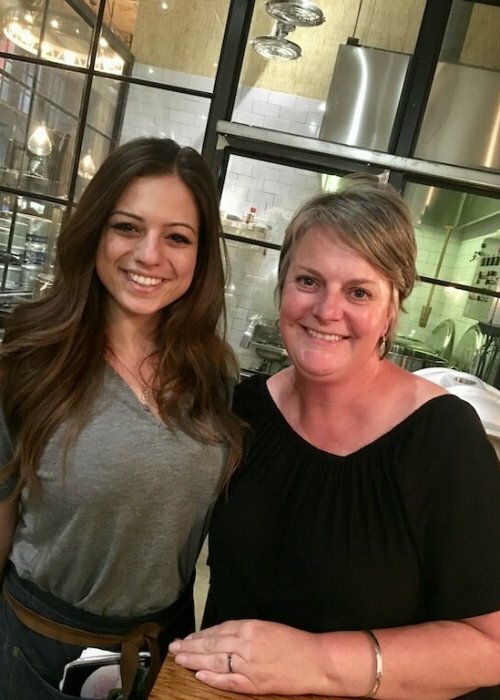 Angela was my waitress at Barley and Board - GREAT service! From the self-guided Mural Tour to the local Community Theatre, you quickly realise that the arts are very important here. And they mean it. For example, take the Denton Jazzfest (an Arts & Jazz Festival) that is held in Denton each April. They offer a free festival because the town believes ALL forms of art should be made available to the general public at no cost. Denton is not just putting history into a case and saying ‘here, come see this.’ It’s keeping the history going. The Firefighters Museum is another example. There, they are open to the public during the week but say ‘don’t be alarmed if no one is there’, and rather encourage people to come and go as they please because it’s at the actual firehouse. It’s keeping history alive. The courthouse is yet another example. It’s still a functioning courthouse, but the office of history and culture hosts the Courthouse-on-the-Square Museum, the grave of John B. Denton, and it provides opportunities exhibitions, another way of keeping the town alive by bringing the past and the present together. And not to leave out the First Lady Costume Museum at Texas Women’s University. I have more on that below, but it was amazing seeing this historical dresses and seeing how much fashion has changed – or not – over the years. The one thing that really attracts me to a place is its uniqueness. When you travel as much as I do, most places tend to blend in the memory bank. (It’s a good thing I take a lot of photos!). This wasn’t the case with Denton. I found Denton to be quirky and full of character. Spending only minutes in town, you get a feel for the place. And when the locals tell you where to go around town, of secret bars and old-fashioned ice cream shops, of art co-ops and tulip festivals, you know it has great character. At first, I thought I was lucky to find a waitress who shared the love of her city. But I found this helpfulness everywhere I turned. So, I took the locals up on their recommendations and what I found was pure joy. The secret bar was one of my favourites. When they have a section on the menu that says “Boozy” you know you’re in a great bar. 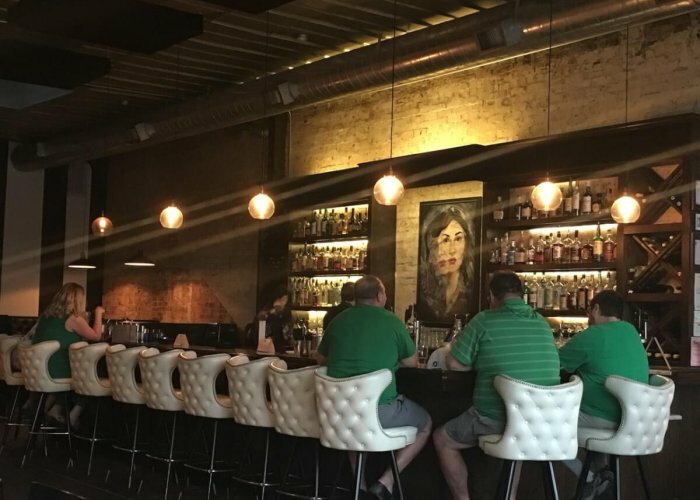 This secret bar is called Paschall’s Bar. I talk move about it in the “Where to Eat and Drink in Denton” section. As I sat upstairs in Paschall’s Bar, I watched a photographer take wedding photos of a happy young couple outside the Courthouse. But, there was something about the bride’s shoes. She seemed to be wearing flat tennis shoes from the distance. I didn’t know what it was. When I was leaving the bar, the couple were at the crosswalk on the other side. So, after congratulating the happy couple, I asked about her shoes. She whipped up the dress and showed me her dinosaur-decorated ‘Toms’. Her friend had decorated them for her wedding. Perfectly quirky. There were quirky things found all around town. Like the painting of “The Great Last Supper”, which is, in fact, depicting the Last Supper. But with a twist. It’s hanging in the LSA Burger Co., which do have GREAT burgers but the restaurant is worth visiting just to see this painting. There’s also the ‘double take’ painting in ‘940’s Kitchen and Cocktail Bar’. It’s also unlike anything I’ve ever seen. I kept looking at it over and over. It’s not a Picasso, but it’s different and I loved it. When it was time for dinner, I decided it was best to ‘spread the love’ around town. Or my money anyway. I do this a lot when I travel. I don’t like going to one restaurant and ordering multiple courses. I’d rather visit one place, order a drink, move on to another and order some appetisers. Move on to another and order another drink and a main. Then another place for a coffee and dessert. I did this in Denton and it was awesome. Every place was unique. Every place offered amazing service and you can read my recommendations in the “Where to Eat in Denton Section”. And then there is the ghost tour. Namely the “Ghosts of Denton” tour. As their flyer says “A town that boasts a grave on the courthouse lawn ought to have a ghost … or two.” Oh yeah! Gotta love a good story and maybe a chill down the back of your spine. I’m all for these kinds of tours. The Great Last Supper at LSA Burger Co.
A (Self-Guided) Mural Tour of Denton. 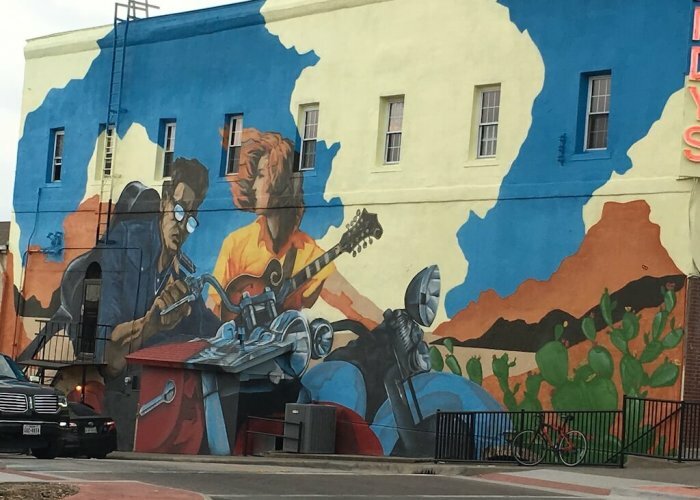 ARTSCAPES is a community beautification initiative, created to inspire civic pride and abate graffiti in Denton’s public spaces by painting new murals throughout the city. And Denton does this beautifully. Pop into the Discover Denton shop in downtown Denton and pick up a map of the murals around town. It provides great information on the artists too! Even the Discover Denton shop entrance has a mural! Located on East Hickory Street, between Locust to Bell, there is a walk that showcases artists who have ties to Denton. Pat Boone and Norah Jones are just a couple of known musicians and for the nerds, Kerry Gammill is also connected to Denton. This was an interesting exhibition and one of the first things I saw after arriving in Denton, due to the hours it was open. 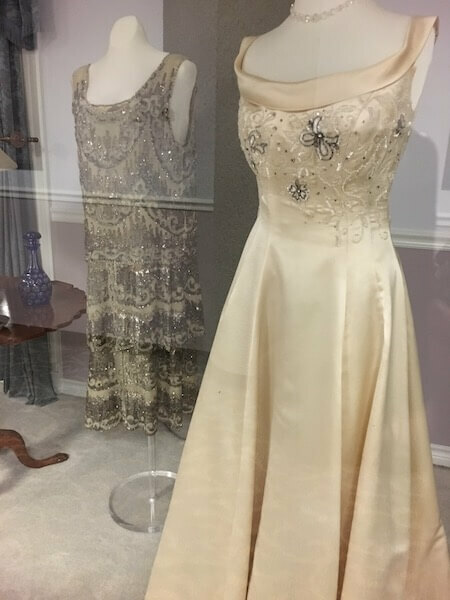 Located on the second floor of the Administration building at TWU, in what seems to be a corridor, is an exhibit of the inauguration gowns worn by the Texas First Ladies. There are even a few Presidential First Lady’s in the mix (think Bush), as Texas did have a few of those over the years. An interesting exhibit for anyone interested in women’s historical fashion. The park is home to the Bayless-Selby House Museum. At the Bayless-Selby House, the walls of this Victorian-style museum tell the story of life in Denton at the turn-of-the-century…From the moment visitors step on the garden grounds or the wrap around porch, the walls of the Bayless-Selby House museum begin their story. * TripAdvisor description This is a free museum, with knowledgeable volunteers providing interesting information upon inquiry. At this living museum – it’s attached to the firehouse – you can see everything from a horse cart from the 1800s to fire grenades. There’s documentation dating back to the 1920s and insights into what it takes to be a firefighter. Word of warning though: It’s only open weekdays, so while I didn’t see it for myself, I’d find it to be fascinating to wander. If you are into the equestrian scene or are even slightly interested in horses, this is worth checking out. North Texas has the largest and most diverse population of horses on the planet. Check out the details at www.horsecountrytours.com. if you’d like to experience real Texas cowboys – and their horses who live very well – check out this tour. The tour itself visits two premier horse ranches, includes lunch and gives an inside look at the Texas equine industry. This area alone hosts more than 350 ranches with 40,000 horses of various breeds such as Quarter horses, Thoroughbreds, Paints, Arabians, Appaloosas, Warmbloods and more. I mention this one again because I’m kicking myself for not doing it. The town of Denton will never look the same in the daylight after a ghost tour with Shelly Tucker! The nationally acclaimed storyteller shares spine-tingling stories and history of the area that leaves audiences thrilled and wanting more. Walking tour. Friday and Saturday night at 8:00, leaving from Discover Denton Welcome Center (111 W. Hickory on the Square). * TripAdvisor description. Oh, the options! And after eating my way through Denton, they are all amazing. Paschall’s is located above Andy’s. How to get in is the mystery. You don’t know Paschall’s Bar is there because there’s no sign for it. And while there is a door to get in, you would think it’s part of Andy’s. 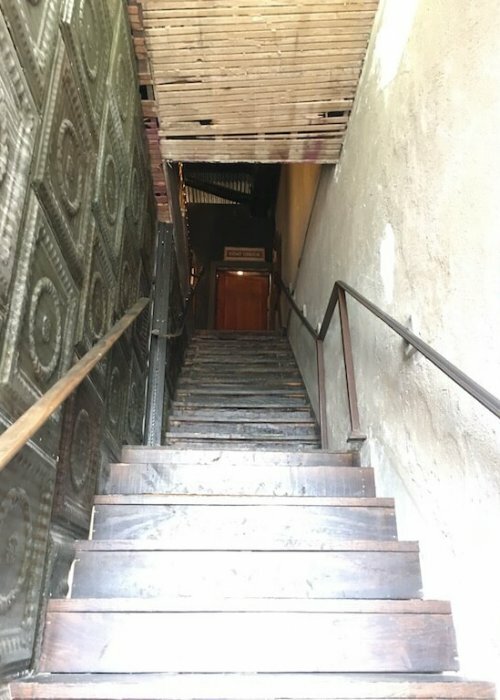 But the door opens to an old staircase and at the top of that staircase is what I can only describe is a bar similar to a speakeasy. There is a pool table and comfortable chairs set into conversational arrangements. The best part is you have a great view of the town. Great for ‘people watching’ (refer back to the dinosaur-decorated shoes Bride). And the drinks are pretty good too! Boozy (as claimed on their menu, so at least they are upfront about it), and goooood. This restaurant is off from the main square, but only just. It’s tucked down Oak Street. This was a happy hour stop and a sampling of Texas Bahn and Red Pepper Hummus, both for $5, which were a great deal! It was the decorating here I loved – From the Denton Texas sign in the back of the restaurant near the bathrooms to the double-take painting behind the bar. 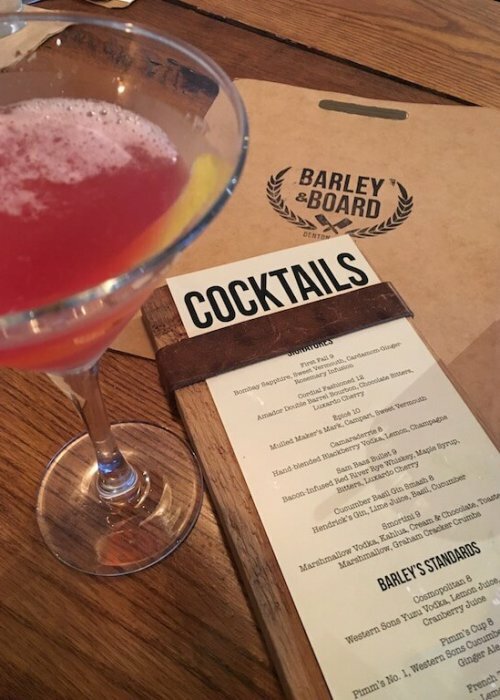 From the moment I walked into Barley and Board, I felt the red carpet had been rolled out. Seriously. I’ve not had such amazing service in a restaurant in years. The hostess offered seats and menus and seconds after she walked away, our waitress appeared, smiling (genuinely) and ready to bring drinks while we perused the menu. The waitress offered explanations of beers and drinks, provided recommendations of appetisers and mains, and once we’d ordered, she brought this and that so we weren’t overwhelmed on our table.And, in doing this, we could enjoy our meal and not feel rushed. Truly, in a typical American restaurant, this is unusual. Usually, it’s how fast can they turn their tables in a restaurant because it’s all about their tips. When we were sated with our beer sampling, a round of appetisers and one (O.K. two) of the best Cosmos I’ve ever had, we declined dessert. When we mentioned we were heading to the ice cream parlour across the square, our decision was supported as a good choice. It was truly southern hospitality from start to finish, offering up what they saw as the best of their city. This was a high recommendation from a few locals. 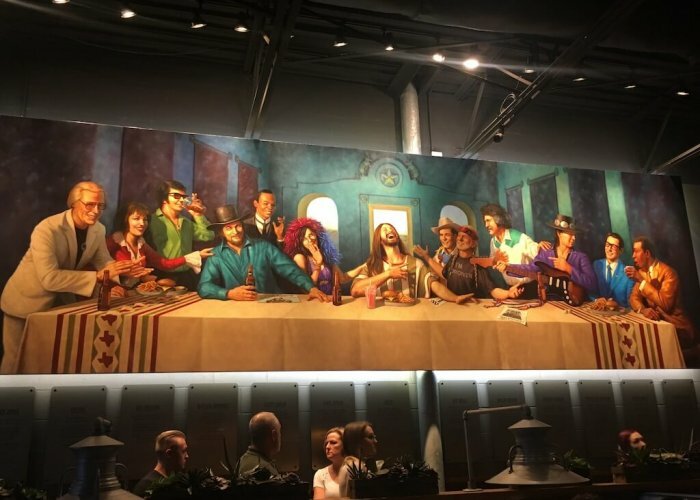 This is the restaurant houses “The Great Last Supper” painting, but the burgers are pretty great too. In fact, TripAdvisor reviews claim the garlic parmesan french fries are to die for (agreed) and one reviewer had this place as “Amazing Burgers with an Awesome Atmosphere”. No matter when I was around the downtown area, this place was packed, at times with a line out the door. Yes, it may be located inside a hotel but if the parking lot is any indication around lunchtime, the guests are not the only customers. I ate here twice – the first was for a quick bite for lunch before exploring Denton, after checking into the Embassy Suites. The second time was for Sunday night dinner. If you want a great option for a Sunday night, this is the place. They have GREAT Happy Hour options! The Spinach & Artichoke flatbread is amazing. Add a bowl of handmade guacamole and a margarita, all for under $20, and you’ve got a happy girl. The service here is not like a lot of ‘hotel restaurants’. You actually feel like you’re a valued customer to their restaurant. Owned by Iron Chef America Winner, Tim Love. High-end, exclusive and hosts a lovely wine selection. Locally-sourced creative cuisine and has a great wine selection. You know that television show featuring an ice cream shop, where ‘pop’ is poured from a fountain and the ice cream is homemade and served in a homemade cone? This is that kind of place. 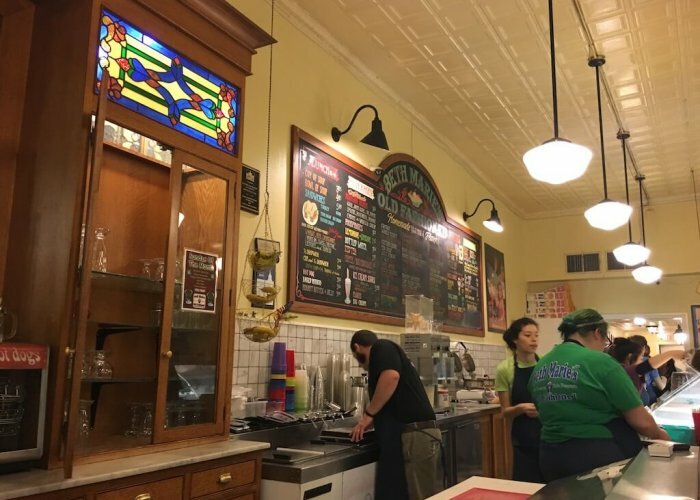 Using ‘a machine built in 1927, which produces ten gallons of ice cream in eighteen minutes, Beth Marie’s ice cream is classified “premium quality”, containing 14% butterfat’, all according to their website. Now, if you’ve been following me a while, you’ll know I’m a bit of an ice cream snob. In fact, I’ve been on a quest to find the best ice cream in the world and even after Beth Marie’s Ice Cream, I still find Miller’s Ice Cream in Margaret River, WA still to be the best I’ve ever had. BUT Beth Marie’s is pretty darn good too. Beth Marie’s certainly beat Miller’s on atmosphere! As described to me, “this is NOT your Mama’s “Embassy Suites“. Indeed not. It’s gorgeous and comfortable. 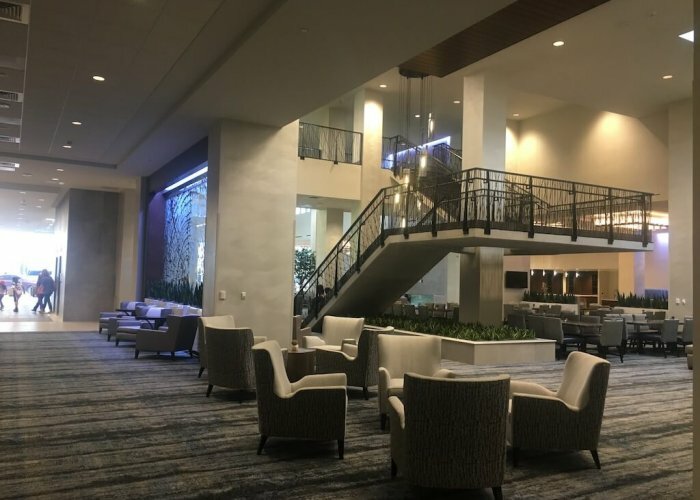 I have written a separate post about my stay at the Embassy Suites by Hilton Denton Convention Center. Click here to read about my amazing stay. Ready to book your trip to Denton? Start here. 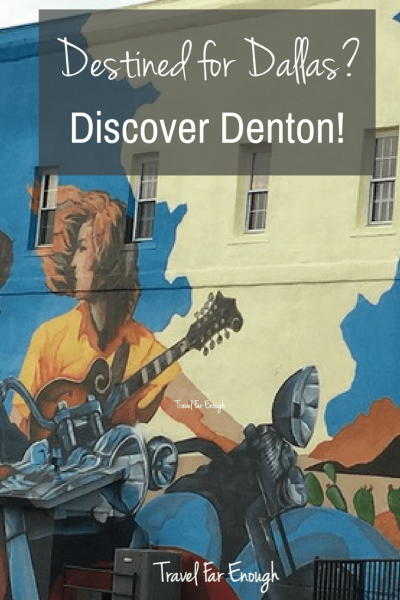 Then check out the Discover Denton website for what’s happening in the city right now. DISCLOSURE: This was a sponsored stay. My thanks to the Denton Convention & Visitor Bureau and the Embassy Suites by Hilton Denton Convention Center for hosting my stay. This was an opportunity I approached, rather than the other way around, after hearing some amazing things about the Denton hospitality. I was not disappointed and appreciate the amazing hospitality shown by both. PLEASE NOTE: I do not promote any brand I have not used or experienced for myself, or have been provided more than one recommendation for. All opinions are my own. Please follow my advice at your own risk. Affiliate links were used in this post. By clicking these links allows the Travel Far Enough website to continue running. For that, I thank you. 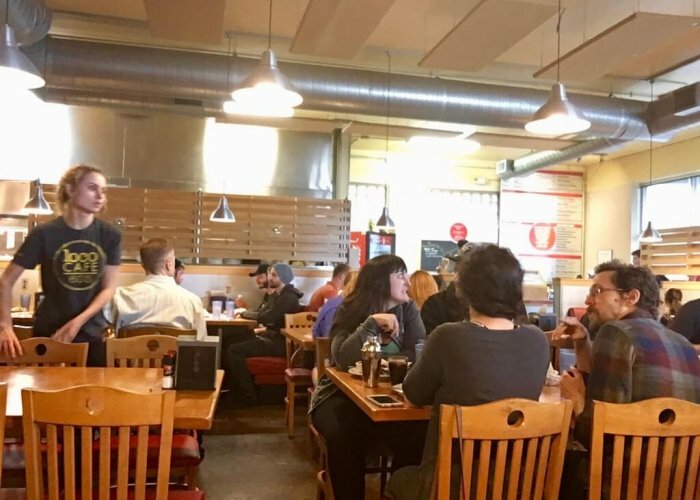 Want to leave a comment or a tip about Denton? Go right ahead! Previous Post This Is Not Your Mama’s Embassy Suites! Hey Bethany! Great to hear from you. I do remember you – B&B had the best service!! Sorry for the delay in getting back to you – I was walking across Spain (800km) with limited bandwidth. =) I like your website – but my professional opinion is to get off Wix and move to WordPress. SO much more reliable (and professional looking too!). Good luck! I’m glad you had such a great experience in Denton and at Barley and Board (I was your hostess), come back soon! I lost your business card but I found your blog and I remember you told me to send you the link to my website/blog!